Experts offer their thoughts on when imaging should be used in suspected head trauma in young athletes. When it is truly necessary to use imaging such as CT or MRI in cases of suspected head trauma in younger athletes? "It depends on whom you ask," says Daniel B. Michael, MD, PhD, neurosurgeon for Beaumont Hospital in Royal Oak, Michigan. "Most head traumas come in through the emergency center. A few others come in through their primary care doctors. Very few come in through a neurosurgeon's office. All have a different perspective as to what imaging should be done." One factor driving the debate among emergency physicians, neurologists, and radiologists is the litigious nature of American society. If physicians don't request images, they run the risk of being sued if it turns out there is a more serious traumatic injury. On the other hand, doctors considering CT scans must weigh the risk of radiation exposure against the risk of missing a serious injury. Complicating the decision is the fact that parents of young athletes often want something done to quiet their fear of potentially catastrophic bleeding in the brain. The temptation to rule out a bleed with an action item decision often outweighs the clinical judgment that a feared potentially catastrophic injury is unlikely. So it's difficult for treating physicians to resist both internal and external pressures to prove lack of structural abnormality. Vernon Williams, MD, a neurologist and founding director of the Kerlan-Jobe Center for Sports Neurology and Pain Medicine in Los Angeles, was recently appointed by California Governor Jerry Brown to the California State Athletic Commission and serves as a neurological medical consultant to professional sports organizations, local colleges, and numerous high school and youth sports/club athletic teams. "It is generally agreed that there's no clear indication for CT scan for concussion in the majority of circumstances for young athletes," Williams says. "CT scans include radiation, which has the potential for side effects/complications. Unless certain red flags are present, it's unlikely that the CT scan will reveal an abnormality, such as bleeding in the brain, that changes treatment recommendations. I believe there is a role for urgent/emergent CT when red flags are present." Red flags that frequently justify the need for CT scan include, but are not limited to, prolonged loss of consciousness, clinical evidence of skull fracture, frequent or repetitive vomiting, progressive neurological decline or worsening level of consciousness and alertness, and significant or worsening abnormality on neurological examination, Williams adds. Akram Alashari, MD, general and trauma surgeon for Grand Strand Regional Medical Center in Myrtle Beach, South Carolina, believes imaging should be used for any patient with suspected head trauma, especially with evidence of loss of consciousness. "Patients with head trauma should undergo a CT scan of the head without contrast. They should also undergo a concomitant CT scan of the cervical spine to rule out any cervical spine fractures," Alashari says. "A cervical collar should be applied to stabilize the cervical spine until it has been determined to be negative for fractures radiographically." The role of imaging in acute injury is to exclude serious intracranial injury such bleeding inside the skull. The role of subacute imaging is to evaluate if there are intracranial injuries that might explain ongoing symptoms, Alashari says. 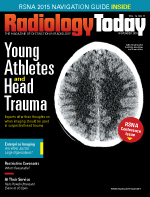 Rahul V. Pawar, MD, a staff neuroradiologist at Saint Barnabas Medical Center in Livingston, New Jersey, clinical assistant professor of radiology at Rutgers New Jersey Medical School, and a member of the Radiology Today Editorial Advisory Board, says that most clinicians, radiologists, and industry leaders are in favor of imaging head trauma in young athletes, as both concussions and resultant traumatic brain injury (TBI)/chronic traumatic encephalopathy have been well documented in the literature. "Furthermore, advanced research by Lipton et al1 has revealed that even 'subconcussive' impacts, such as soccer heading, may result in white matter microstructural damage that may lead to diminished neurocognitive performance," Pawar says. "Neuroimaging plays a critical role in the management of patients with suspected TBI; advanced techniques including diffusion tensor imaging (DTI), MR spectroscopy, and perfusion imaging are being exhaustively tested to determine their diagnostic and prognostic value." • determining the prognosis of patients to tailor rehabilitative therapy or help with family counseling and discharge planning." "CT should be used to detect injuries that may require immediate surgical and/or procedural intervention, for example, epidural hemorrhage, subdural hemorrhage, parenchymal hemorrhage, calvarial fractures, CSF [cerebrospinal fluid] leaks, etc," Pawar says. "Frontline health care providers should familiarize themselves with published recommendations regarding the management of TBI." Yvonne W. Lui, MD, an associate professor of radiology and section chief of neuroradiology at NYU Langone Medical Center in New York, notes there are different sets of criteria that doctors use when determining whether to use CT, including the so-called New Orleans Criteria and the Canadian Head CT Rule. While some of the criteria are similar, there are slight variations based on which criteria are used. "The [New Orleans criteria] includes headache, vomiting, age over 60 years, drug or alcohol intoxication, deficits in short-term memory, physical evidence of trauma above the clavicles, and seizure," Lui says. "The [Canadian Head CT Rule] differs a bit and includes a Glasgow Coma Scale (GCS) score—a test of consciousness level—of less than 15 at two hours post injury, suspected open or depressed skull fracture, specific clinical signs that might suggest a fracture of the skull base (such as blood in the middle ear or a 'raccoon eyes' appearance), two or more episodes of vomiting, and age greater than or equal to 65." Michael recommends applying the scientific data-backed Canadian Criteria to determine whether a CT scan or MRI is necessary. This system assigns numbers to key criteria and the final tally is used to determine whether imaging is necessary, which he says is 98% accurate. The Canadian Head CT Rule does not apply to children under the age of 16. For children under that age, the Pediatric Emergency Care Applied Research Network (PECARN) offers its own algorithm for children under the age of 2 and another for those between the ages of 2 and 16. The PECARN Pediatric Head Injury/Trauma Algorithm is based on a GCS score and other symptoms. It recommends a CT scan for all children with GCS scores less than 14. For children with GCS scores 14 or greater and a history of loss of consciousness, vomiting, severe headache, or severe mechanism of injury, PECARN recommends observation and possible imaging if symptoms worsen during observation or several other criteria are evident, according to MDCalc.com. The American College of Surgeons, of which Michael is a member, is currently considering the standards. He believes the review process will take at least a year but is hopeful that adoption of these standards will lead to more appropriate use of imaging. "The Canadian Criteria provides the best evidence out there as to whether a CT scan should be taken following an injury," he says. "Adoption of the Canadian Criteria could lead to more scientific use of imaging, and reduce unnecessary imaging and the costs associated with it." The other major and frequently employed imaging option for youths with head trauma is MRI. Studies suggest MRI can be superior in evaluating subtle TBI for the characterization of TBI after an injury, but does not often change treatment in the immediate evaluation of head trauma. But that is being reconsidered. "Certain sequences and techniques reveal structural changes that were not appreciated, even recently," Williams says. "While many official guidelines imply that there is no role for imaging [including both CT and MRI] in most sports-related concussions, many neurologists order MRI with specific sequences and techniques to assess for subtle changes and abnormalities that might change management decisions." Lui says that in subacute and chronic care settings, if a patient has had a concussion and has prolonged symptoms or unexplained neurological deficits, a doctor may order MRI. This can detect subtle areas of white matter injury, microhemorrhage, or other unexpected findings. Williams thinks there's a significant role for MRI in many scenarios. For instance, if an individual is experiencing unusual, severe, or prolonged symptoms, or is weighing appropriate recommendations regarding return to play—that season or at all—Williams frequently recommends susceptibility weighted imaging, DTI, or even functional MRI to collect information that contributes to management recommendations. There is recognition of the need to limit exposure to radiation, particularly in the pediatric and adolescent population, as well as concerns about cost and the possible effects of false negative testing. Alashari says one major issue that complicates imaging for TBI is the fact that immediately after the trauma, very small lesions may not appear on the initial CT scan. Some of these patients will present with symptoms in a delayed fashion because of the false-negative results of the initial CT scan. "Many injured individuals have had a normal CT in the emergency department and assume there's no structural abnormality and everything is fine," Williams says. "Some of these individuals never met accepted criteria for the CT, but may still have suffered brain injury with structural and functional abnormalities that might be detected [later] with appropriate imaging that would change management recommendations." Pawar notes that numerous real-world issues that complicate head trauma imaging. "Young athletes suffering minor head trauma may not present for medical attention," Pawar says. "Moreover, those who do may not receive an advanced neuroimaging workup, especially when treated at smaller community hospitals. The implications of TBI and CTE are significant. Aside from acute injuries that may require prompt surgical/procedural interventions, long-term sequelae of mild or moderate TBI include disordered cognition and/or behavioral afflictions such as depression, anxiety, personality changes, aggression, acting out, social inappropriateness, etc." According to research published in Pediatric Emergency Care by Wylie and colleagues, hospitals with lower volumes, community hospitals, and providers without specialized training tend to use CT scanning more commonly.2 MR examinations may not be ordered for a variety of precluding factors, such as availability, patient intolerance, and long scan acquisition times. "In young athletes, namely children, first-line CT imaging may be crucial in excluding brain injury that may require surgical intervention; in such cases, benefits far outweigh the risk of radiation," Pawar says. "Yet, in a substantial percentage of cases where injury is mild, such as minor concussions and/or subconcussive impacts, the cumulative radiation dose imparted by CT is not insignificant." Lisa Kennedy, PhD, CEO of The Eagan Institute, an advanced diagnostics and treatment center that combines years of experience in patient care with technology in functional imaging and neuroengineering, says the whole debate comes down to determining the appropriate use of imaging in young athletes only when it's warranted to identify something that is really likely to put them at risk. "I think if we can image younger athletes with nonradiation modalities—those that give us a good picture of the functional imaging of the brain—we can get a feel for how a TBI is impacting things like recall, emotional regulation, and auditory and visual processing," Kennedy says. "The main problem is most of the modalities we have are structural imaging and we can't see functional damage. We're starting to see this with QEEG [quantitative electroencephalography] and we're now getting to the point where there have been more than 100,000 QEEG brain images, significant advances in quantitative and digital analysis so that the signal-to-noise ratio has vastly improved, and we're seeing validated biomarkers for different functional brain disorders. "QEEG can tell you years later where a patient has sustained a TBI—you get a very specific signature at the place on the head where the athlete was hit," she adds. "Unless the TBI was really substantial, these are things that won't come up in structural imaging with MR or CT."
Williams notes that the medical industry is learning more and more about the true nature of TBI as imaging expands and evolves. "Technologies, and experience with these technologies to study individual patients and populations, will contribute greatly to our knowledge and ability to provide the best care and recommendations to injured individuals," Williams says. "However, we're at a unique point in time where the advances and access to imaging studies including these techniques is so rapidly increasing that it's outpacing our ability to provide conclusive recommendations based on large volumes of high quality evidence. So we use the best available evidence in conjunction with clinical skill, experience, and expertise to provide best recommendations at this time. It will take time to collect and analyze enough information to answer many basic but important questions." 1. Lipton ML, Kim N, Zimmerman ME, et al. Soccer heading is associated with white matter microstructural and cognitive abnormalities. Radiology. 2013;268(3):850-857. 2. Wylie MC, Merritt C, Clark M, Garro AC, Rutman MS. Imaging of pediatric head injury in the emergency department. Pediatr Emerg Care. 2014;30(10):680-685.